76 Eleventh Avenue. Rendering by Bjarke Ingels Group. Chelsea has long been a center of creativity in Manhattan. Recent developments have been strongly inspired by that history. Many of the city’s most notable projects with distinctive architecture style have popped along the new High Line Park, including the Frank Gehry-design IAC Building, and Zaha Hadid’s 520 West 28th Street. 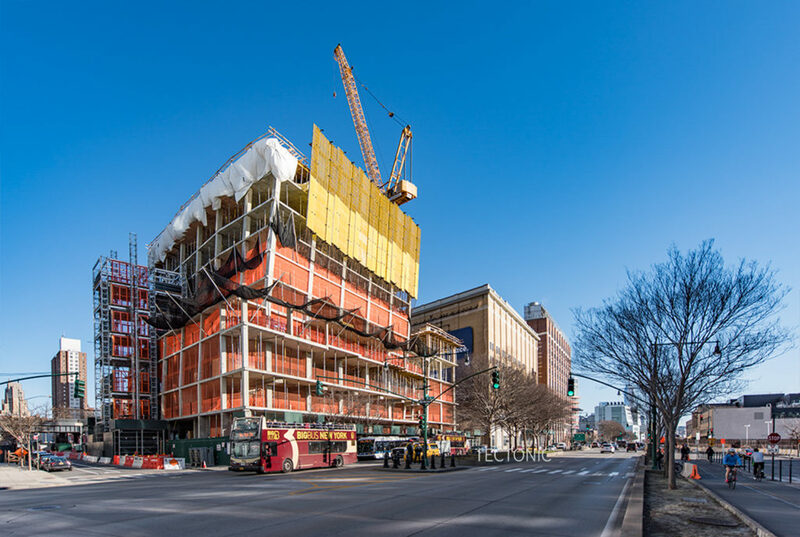 The neighborhood’s latest impending icon is 76 Eleventh Avenue, a pair of twisting mixed-use towers under development by HFZ Capital. Construction is moving quickly for all components, and thanks to photos by Tectonic, we can see the latest progress. Construction on the western tower has now reached the tenth floor, out of a planned 35. Once finished, it will reach 402 feet above the ground. 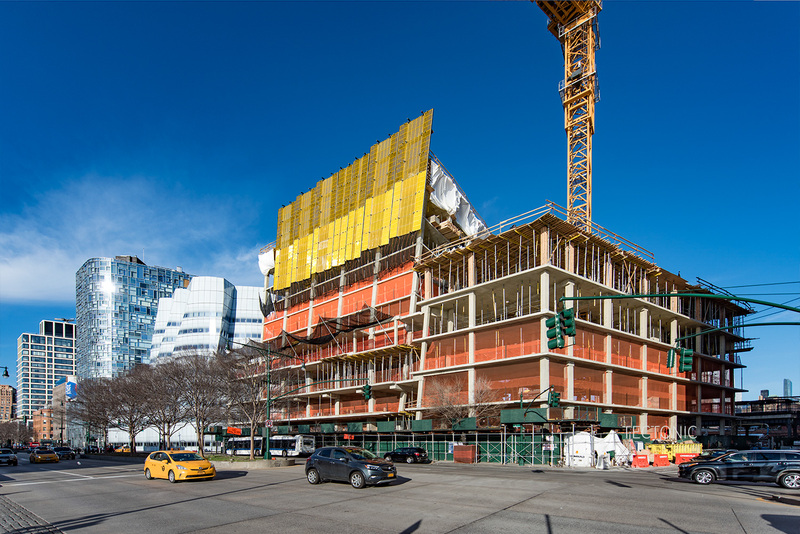 The structure is beginning to have a noticeable prominence, and will evidently be especially dominant when viewed from heavily trafficked 11th Avenue and adjacent Chelsea Piers. The 25-story eastern tower will be of a nearly identical design, but won’t rise quite as high, measuring one hundred feet shorter. Foundation work for that part of the project is well underway, and it appears imminently ready to begin rising above the ground. 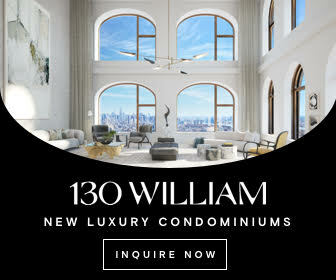 76 11th Avenue is the second development designed by Copenhagen-based Bjarke Ingels Group (BIG) to rise along Manhattan’s Westside waterfront. 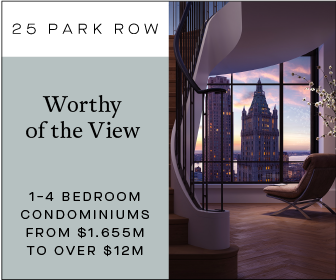 It’s just under forty blocks away from the eye-catching Via at 625 West 57th Street, developed by the Durst Organization. 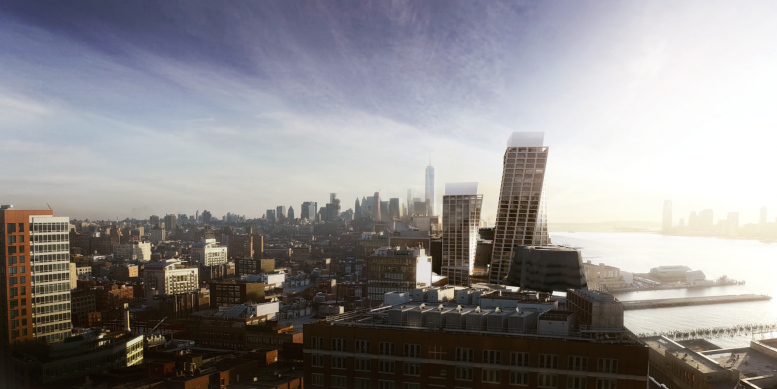 Earlier this week, YIMBY also revealed the first renderings for BIG’s proposed NoMad tower. The mixed-use towers at 76 11th Avenue will yield around 181,890 square feet for a new commercial center within the first four floors. 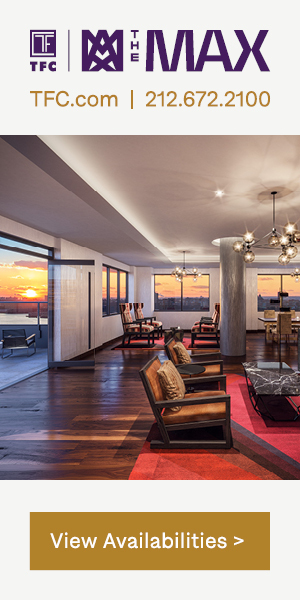 Six Sense Hotels is also expected to open up shop inside the 25-story eastern tower. 240 residential units will occupy the rest of the project. 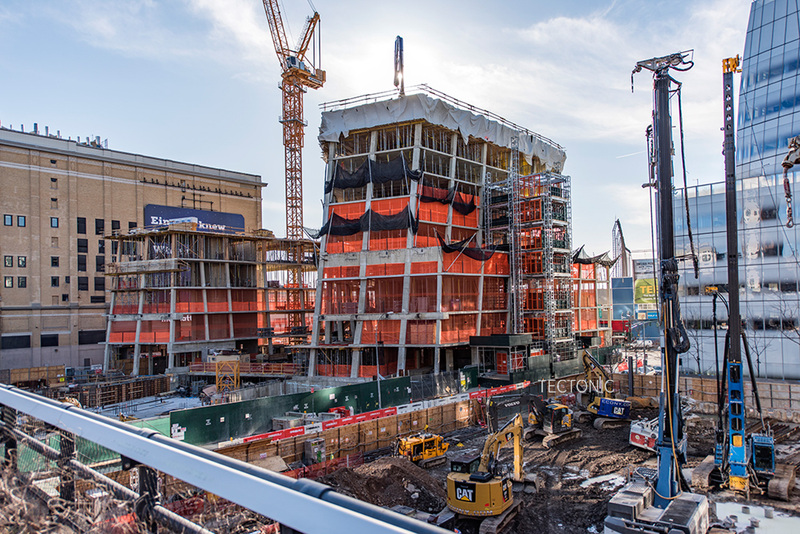 The project has received funding from a $1.23 billion senior loan, $258 million from an EB-5 mezzanine loan, and $225 million in developer equity. HFZ purchased 800,000 square feet of air rights to maximize the site’s buildable square footage. 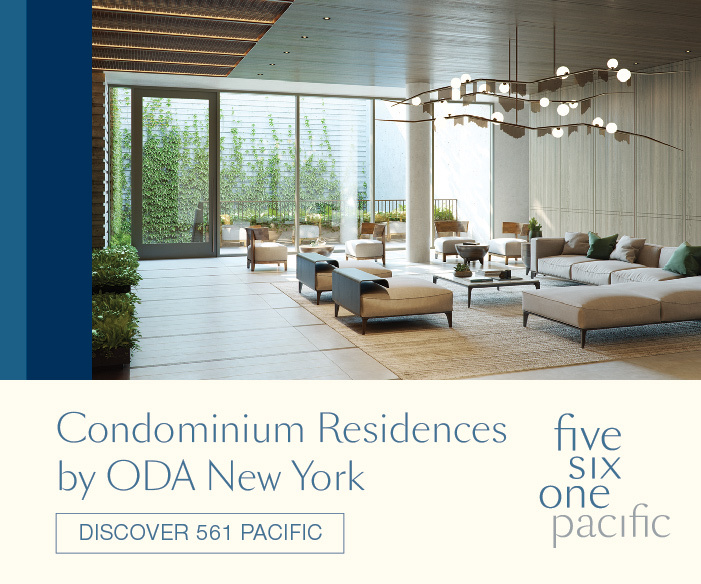 Omnibuild is overseeing the project’s construction, which will offer 360-degree views of the Hudson River and Manhattan alike. Completion is expected by 2019. 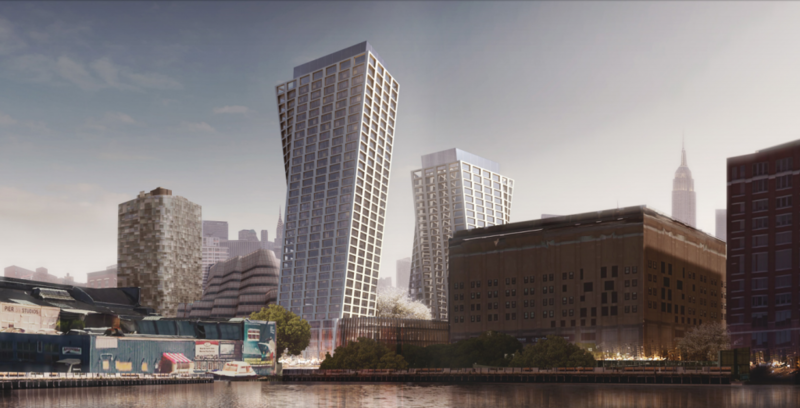 12 Comments on "BIG’s Twisting Towers at 76 Eleventh Avenue Begin Making An Impact on the Chelsea Skyline"
Please pardon me for using your space: Do you like coffee bean on steel? 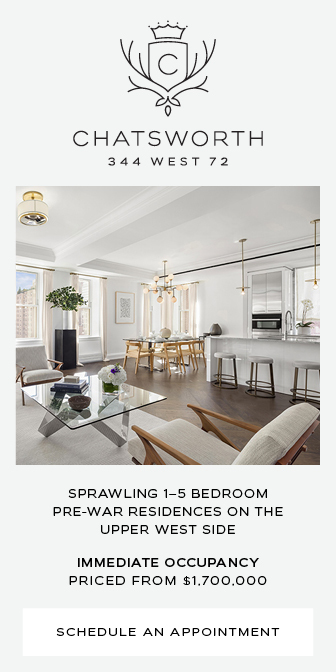 to pay top dollar to live in the next building that they’ve been told is “chic”. And which no doubt will make them “chic” in turn ….in their minds. They quite deserve each other. But New York deserves better. For the Leaning Towers of Chelsea will be more like the Laughing-Stock of Chelsea. Stan, I agree. This building, and way too many others, trys too hard. LOl enjoy the Upper East Side then guys. Anybody know if there are plans for 520 W. 17th Street next door? I vote developers do that one next. Just looking at them from afar is making me feel sick. These buildings begin to address the net brutalist sameness of the NYC skyline, which, like the city’s aging infrastructure, continues to compare poorly with the revitalized old world (London, Berlin, Copenhagen) and terribly with the vibrant world in Asia (Shanghai, Beijing, Tokyo). The dismissive stolidity of so many opinions in New York continues to amaze me. This was once a cosmopolitan city. Now it is aggravated by fun? Won’t folks keep sliding outta’ bed? Fun – like beauty – is in the eye of the beholder…. These are not towers in a suburban landscape, but part of a cityscape and they do not add to it. The space that buildings create in a city are more important than the buildings with the exception of important civic structures; city hall, churches, museums and major libraries. The Romans got it right 2000 years ago. Commercila buildings and apartment houses do not make that grade and are supposed to be background. My apartment overlooks West Chelsea, while they do have this dramatic “twist” these buildings just Loom over the rest of the Chelsea skyline, new and old. How could they have received approvals for such an out of scale projects? It looks ridiculous on the skyline. As a non apologetic capitalist, it troubles me how very few humans will get to use this twisted giant, adding a big clunker in our area!